Since discovering Angela Day’s winning Mince Pies recipe a few years ago I have not bought a shop one, I just can’t bear the thought of eating any, other than these. Many times when sharing these I have been told “I don’t usually like Christmas Mince Pies, but these are delicious!” The secret is her almond topping. Not only are these heavenly but they are ridiculously easy to make. Sadly Angela Day has hung up her apron and the website no longer exists. I have only made 1 change to her recipe, I make a different pastry (passed down from my Grandmother). I don’t know what the Angela Day pastry is like as I have never made it, my pastry is delicious, versatile and contains no eggs, which is vital to me as my son Fjord is allergic to eggs. Angela Day says to bake for 15 – 20 mins at 180 but I do them for about 25 mins or until golden on top. The recipe makes about 18 with a bit of left over pastry which I fill with jam for a couple. Put this in the fridge to chill for about half an hour or so. Fill with about 1 heaped tsp fruit mince. 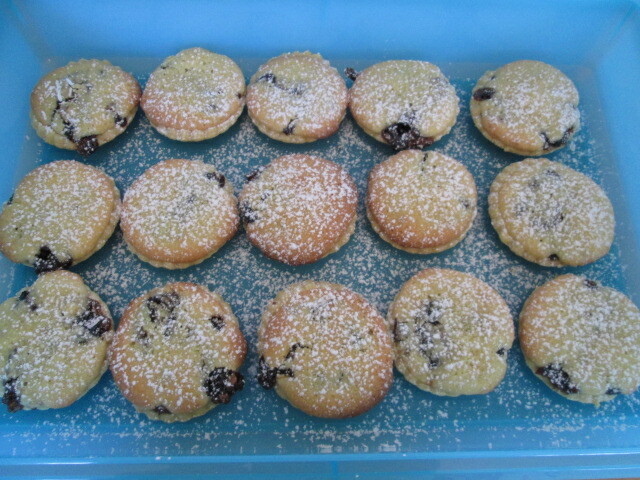 Bake at 180 deg C for 20 – 25 mins until golden on top and dust with icing sugar. Oh boy, I love mince pies but sadly not another single soul in the family eats them. It feels like too much trouble for myself?